Massage chairs are a highly specialized type of seating designed to provide many of the benefits of visiting a massage therapist, while taking the therapist out of the equation. Even using cutting edge technology, the very best massage chairs can’t compete with a skilled massage therapist, but they do offer a number of compelling advantages, first among them being the sheer convenience of being able to enjoy a massage from the comfort of home, anytime, day or night. As you’ll see, there are a surprising number of variations. Broadly speaking, there are two different kinds of massage chairs: Professional and Consumerist. Professional massage chairs are portable massage chairs used by therapists in the conduct of their business. Mostly, these types of massage therapy chairs are used by private, licensed practitioners who get contracted by area businesses to give massages to their employees as one of the “perks” of the job. These chairs are decidedly old school and purely functional, designed to give the masseuse easy access to the neck, back and shoulders of the client during the massage. They tend to be almost purely functional and designed with only minimal creature comforts, such as a padded headrest for the client. Where consumerist chairs are concerned, these can be broken into two distinct groups: Therapeutic and Hobbyist. 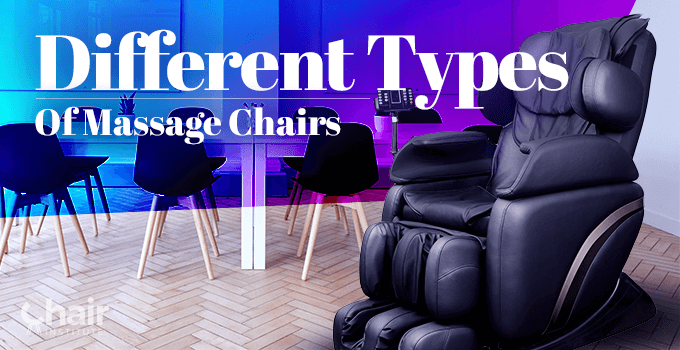 Therapeutic chairs tend to focus heavily on features designed to alleviate chronic pain, while hobbyist chairs tend to include more convenience features that appeal to users interests tastes, and preferences. Obviously, there is often considerable overlap here. 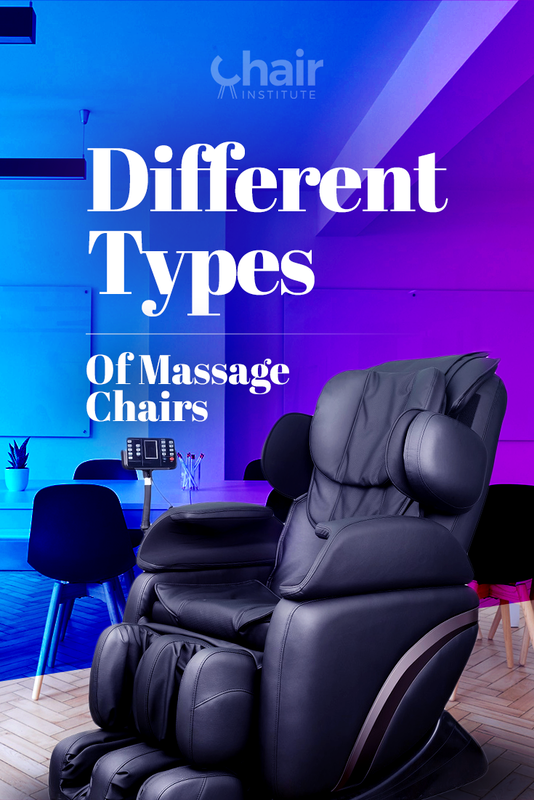 It’s common to find massage chairs that slant heavily toward therapeutic features﻿﻿﻿﻿﻿, while offering a couple of hobbyist-oriented features too and vice versa. As a general rule, though, you can look at the features of any given chair and say that it favors one category over the other. Hobbyist chairs are essentially generalist chairs. They’re good at relieving minor muscle tension and lowering a person’s stress level while offering a comfortable, relaxing experience. Therapeutic chairs tend to focus on addressing one or two specific problems, with specific feature sets slanted accordingly. For instance, a therapeutic massage chair focused on easing sciatic nerve pain will focus much more on providing an excellent lumbar and leg massage, while a chair designed to alleviate chronic neck pain will obviously focus more features in the area of the neck and shoulders. This broad classification is instructive but has its limitations. To drill down more deeply into this world, we’ve got to further sort chairs by some other classification. This is a stark division. Every massage chair on the market today is built around one of these frame types. These were the very first massage chairs manufactured. The chairs are built around a rectangular steel frame in the back of the chair where massage rollers, massage balls, or fixed-position heads are mounted. If there’s any movement at all, the massage mechanisms can only move along the X- And Y-Axis, although in practice, almost all the chairs made with a fixed frame these days use only stationary massage heads, so there’s no movement at all. The pressure point﻿﻿s﻿ in your back either align with the heads, or they don’t. If they do, you’ll get a decent massage. If not, your experience will be sub-par. You don’t find many fixed-frame chairs for sale these days, and when you do, they’re invariably at the extreme low end of the market. The least expensive chairs, using the oldest (outdated) technology. This is the current industry standard. The S-Track is a steel frame that’s bent in an S-Shape so that it follows the natural curve of your body’s spine. Mount rollers onto this frame, and they’ll move in three dimensions, adding the Z-Axis at the points where your spine curves. S-Track massage chairs are the most commonly seen on the market today, and every major manufacturer has at least a few options available. They render a high-quality massage experience that starts at your neck and goes to the small of your back. This is the most recent frame innovation, consider this to be an S-Track on steroids. The frame gets its name from its overall shape, because the track continues past the small of your back, curving under the seat to allow the rollers to massage your glutes and the backs of your thighs. These massage chairs often come with leg massage ports, extending the massage experience down to your calves, and sometimes even to your feet, giving you something closer to a full body massage experience. Even breaking the various chairs on the market today down by frame type still doesn’t completely clarify the picture, so we’ll dig deeper still. Unfortunately, this isn’t terribly helpful, because specific features are just that – features. They can be added to most any design. Once in a while, feature-based classifications can be useful, generally in cases where a given feature is astoundingly rare, but mostly it comes down to “features” that are more consciously made design decisions. Most of the massage chairs sold today are optimized for users ranging from 5’ to about 6’1.” If you’re taller than that, chairs that are optimized for “regular sized” people won’t render a good massage for you. There are two reasons for this: First, the rollers wind up hitting the wrong spots on your back. Second, if the massage chair in question has leg massage ports, they’re not designed to properly accommodate your longer legs, so again, the rollers or air bags are going to be focused on all the wrong spots. Some massage chairs, however (about 25% of the ones on the market today) are built with extendable ottomans that automatically detect your leg length and adjust accordingly. These chairs will accommodate users up to 6’5”, depending on the manufacturer. While most manufacturers offer at least one model built with taller users in mind, Kahuna massage chairs get a special nod in this category, because most of their models feature extendable ottomans, and they’ve even got one chair that’s custom designed for big and tall users, the SM730﻿0. These chairs were designed and built for people who place lots of importance on aesthetics. They want a massage chair, yes, but they don’t want it to stick out like a sore thumb in whatever room they’ve put it in. Unfortunately, most massage chairs have leg massage ports, which some people view as a bit of an eyesore. Some chairs, though, utilize a “hideaway ottoman,” so when you’re not actively using the chair to get a ﻿massage﻿, you can fold the leg massage ports into the ottoman where they’re invisible. At that point, the chair looks like a typical piece of living room furniture. Human Touch gets a special nod here. A majority of their models feature the hideaway ﻿﻿﻿﻿ottoman﻿﻿, and the company is known for their stylish, striking designs. While this is technically a feature, it’s such a rare one that it deserves its own classification. There are only a handful of massage chairs on the market today that offer inversion therapy. The best of the bunch is the Daiwa Legacy, but there are a small handful of other models that offer similar functionality. Current industry standard is quad rollers, though you will find some value-priced chairs using tri- or dual rollers, and in a couple of instances, you’ll see a six-roller array. Most massage chairs offer ﻿Shiatsu﻿, but some also offer Swedish, Thai, and others. The more airbags the better, although bear in mind that airbags are now in their second generation, so for instance, a chair with 30 Second Gen. Airbags will give you a better massage than a chair with 40 First Gen. ﻿airbags﻿, so it pays to ask questions about the technology if this feature is important to you. There are two options here. Most chairs use an Automatic Body Scan. Before your massage begins, the chair will take a scan and make automatic adjustments to the position of the rollers and the width of the massage field. That works 95% of the time, but if it doesn’t, it will leave you with a substandard massage. Some chairs skip the Body Scan-Tech and simply provide buttons on the remote that allow you to tweak the roller positions and massage field width. This takes a bit of tinkering, but guarantees that the rollers are always in the right place. An increasing number of models are now offering both (currently found in nearly half of the massage chairs sold). Calf and Foot Massage – Standard implementation is air massage for calves, dual rollers for the soles of your feet – look for “extras” in this department if the feature is important to you, like heated calf or foot wells, the ability to set the massage intensity of the foot rollers, etc. Body Stretch (and/or Waist Twist and/or Hip Swing) – These are powerful therapeutic features that provide almost immediate pain relief. Heat – About a quarter of the chairs on the market today offer ﻿﻿﻿﻿heat﻿﻿﻿﻿, mostly in the lumbar region, though you’ll find a few chairs that also offer heated leg massage ports, seat heat, whole back heat, and so on. Deep Tissue Massage – You’ll see this listed one of two ways. A manufacturer will either call it a “Deep Tissue Massage,” or it will be listed as 3D/4D Technology. Spot/Partial Massage Modes – This allows you to interrupt any massage program and focus the r﻿ollers where your back hurts the most. Zero-G Seating – About a third of the massage chairs sold today offer this. Most only offer one seating position, though you will find some chairs that offer two, or even three positions. Music Support – Three possible implementations here: SSD card (worst), USB port (standard), or Bluetooth compatible (best). Space-Saving Technology – Massage chairs typically require a lot of room to use. You’ve got to set them 18-24” away from whatever wall you set them near if you want to be able to recline fully. Chairs designed with Space-Saving Technology minimize this. By pivoting on their base as they recline, only about 4” of wall clearance is needed, and that’s a big win for home users for whom space is at a premium. Chromotherapy – These are LED “running lights” built into the chair. If you dim the lights in the room before your massage begins, it supposedly helps you relax. Air Ionization – Another technology designed to help you relax, by blowing cool, ionized air on your face. Memory Slots – Quite rare, unfortunately. This feature provides a limited number of “slots” that allow you to create a customized massage routine using your favorite settings, and save it for reuse later. As you can see, there are many different types of massage chairs and lots of different ways to classify them. It’s a big, busy, bustling market, with new technologies being introduced all the time. At the root though, these chairs are all about providing a relaxing, refreshing massage experience from the comfort of home, no appointment needed. I need a chair which will hit the glutes and is built to handle a 6’3″ 275lb “linebacker” build. We’ve done quite a bit of research on this topic. Here are our findings. Very good article and just what I needed. I will buy a chair and some of the jargon left me with questions which cleared up 98% for me. What is heat 77? Is this something new? How can sellers on Ebay sell the chairs so cheaply while local stores want $2500+? Hey Jerry, and thank you. Glad we could help! To your first question, “Heat 77” appears to be unique to one particular model of chair – the BM (Best Massage) EC77. These chairs are of Chinese manufacture, serving the value segment of the market. As near as we can tell, there’s no functional difference between regular heat and “heat 77.” Our guess then is that this is a bit of copy and paste confusion by vendors, and that the 77 is actually a reference back to the model number. As to your second question, there are a couple of different factors at work here. First, digital sellers don’t have nearly the overhead that brick and mortar vendors do, so they don’t have to pay rent for a building, they don’t have to pay for a warehouse to store inventory, etc., which translates into a bit of savings to the consumer. Second, though, a significant percentage of eBay sellers are actually resellers. They’ll wait for manufacturers to introduce a new model, then swoop in and buy up the remaining older model inventory, often at a steep discount, passing those savings along to their customers. Other vendors buy chairs that have been purchased previously, returned and refurbished to “like new” condition, which they can also sell at a generous discount. A few online vendors contact manufacturers and buy direct and in bulk, but this only applies to very large, well established online sellers with lots of money to spend. First and foremost is the issue of trust. If you’ve never bought anything from a given online seller, then you don’t have any firsthand experience with the quality of the vendor – on eBay, be sure to check out the feedback left by other people who have purchased from the vendor you’re considering, to give you a better sense of what to expect. Second, brick and mortar stores often offer perks like home delivery and setup (“White Glove” service). Some digital sellers (Amazon in particular) also offer this as an add-on, but we’ve never seen that kind of thing from an eBay vendor. Finally, there’s the issue of “buying blind,” which is to say, buying something without testing it out to make sure it’s a good fit. Here, think in terms of trying clothes on before you buy them from a store, versus measuring yourself and ordering clothes online. Maybe they’ll fit well and maybe they won’t, something you know for sure if you had a chance to try on the outfit in the store. Same idea with massage chairs. If you go to a brick and mortar shop, you have the opportunity, over the space of just a few minutes to “try on” several different models to see which one is the best overall fit for you. There’s value in that, although some people take the approach of going to the brick and mortar store to try several models out, then go online to find the model they like best for a cheaper price.